OAKLAND (California) • The Golden State Warriors blew a 31-point lead at home, an epic meltdown in the words of their coach Steve Kerr, that allowed the Los Angeles Clippers to deliver the biggest comeback in National Basketball Association (NBA) play-off history. Lou Williams scored 36 points and Montrezl Harrell (25) nailed clutch late free throws, as the Clippers surprised even themselves to square the first-round series at 1-1 with their 135-131 win over the two-time defending champions. "We got up by 31 and we shut down. They scored 85 points in the second half. "We had really done a good job defensively in the first half. So we kind of messed with the game a little bit. When you do that, you're in some trouble, especially in the play-offs. "We got exactly what we deserved." For the Clippers, it was simply a case of not giving up. Their coach Doc Rivers told his players at half-time, when they were down by 23 points as they had been down 14 in Game 1, to just "hang in there". "I said, 'We are going to win this game'. I was honest with them. I said, 'I don't know how. Just hang in there with each other'," he said. Once you lose momentum in a game, it is hard to get it back. We lost this game in the middle of the third quarter when we stopped playing. STEVE KERR, Warriors coach, on their late collapse. "This is who we are." The Clippers topped the LA Lakers' rally from a 29-point deficit to beat the Seattle Supersonics in 1989. The 85 points are also the second-most in the second half of a play-off game behind the Milwaukee Bucks' 87 in Game 3 of the 1978 Western Conference semi-finals against the Denver Nuggets, according to ESPN Stats & Information research. "We changed a couple things offensively and defensively on the fly in the third," Rivers added. "And it worked out for us." The Warriors got more bad news after the game when they learnt that centre DeMarcus Cousins suffered a serious injury. He injured his left quad in the first quarter and was expected to have an MRI scan done on it yesterday. "It is a significant quad injury," said Kerr without going into detail. "He is going to be out a while." Stephen Curry (29 points) put the Warriors ahead 131-128 on a three-pointer. 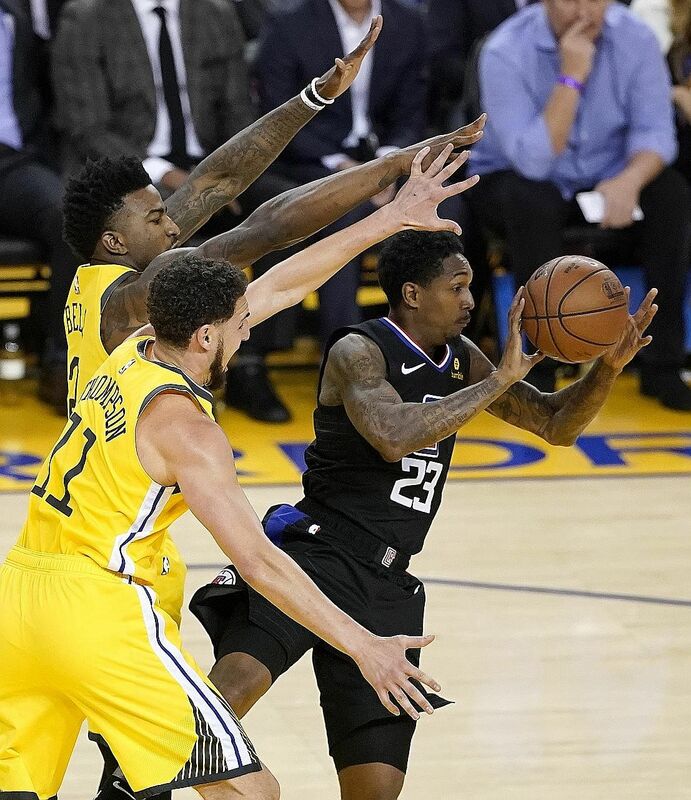 But 12 seconds later, Williams, who had 11 assists and hit 13-of-22 from the field and eight-of-10 free throws, drained a key jump shot over Klay Thompson with 46 seconds left. After Thompson missed a shot from beyond the arc, the Clippers' Landry Shamet hit a three with 16 seconds left for the winner. Harrell sank two free throws with five seconds left to cap the scoring. "We let our guard down," said guard Thompson, who had 17 points. "We weren't the aggressors any more. "I'll bounce back. The whole team will. We'll right the ship." In Philadelphia, the 76ers seized control in a 51-point third quarter to set a team record for points in a quarter and a play-off game, and evened their series at one game apiece with a 145-123 victory over the visiting Brooklyn Nets. Joel Embiid had 23 points and 10 rebounds to lead Philadelphia, who shot 72 per cent from the field in the third quarter after the team had been booed off by their own fans in the opener.